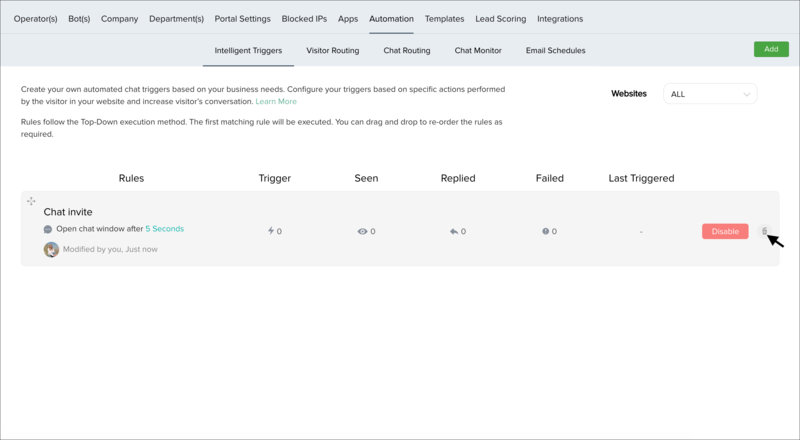 Trigger an action to your website visitors at different instances and grab the attention of your website visitors using the intelligent triggers. Perform predefined actions when the visitor lands on your website or is accessing your web page. You also have an option to set custom triggers for your website. How to trigger an action when the visitor leaves your website? How to automate the process of updating the leaving website visitor info into Zoho CRM? How to automate the process of adding the leaving website visitors to the email campaign list? How to trigger the visitors when they perform a custom action? Navigate to Settings > Automation > Intelligent Triggers. Click on the Add button to set an intelligent trigger rule. Map the rule to a particular website. Now, select the option when you would like to trigger the visitors on your website. Lands on my website: Trigger an action only when the visitor hits the exact landing page of the website for the first time. Accesses any page on my website: Trigger an action when the visitor accesses any chosen page on your website, where the rule is set. Performs a custom action: You can set your custom action and can trigger your visitors, when they perform the action on your website. Leaves my website: Trigger an action once the visitor leaves your website. Select a pre-defined condition from the drop down to define the type of visitor you would like to trigger an action while visiting your website. Current page URL of the page where the visitor is accessing. Current page title Title of the page where the visitor is accessing. Set criteria based on the trigger status, whether the trigger is invoked or not. URL of an important page, where you like to be intimated if the visitor leaves that page and moves to another page. Then, select a criteria type and enter a value based on the condition in the text box. Select an Action from the drop-down list. You can animate the button to move from right to left or top to bottom when the visitor visits your website and grab the attention of the visitor. You can make the button glow and attract the visitors to chat with you. Invoke your own custom trigger in the website and grab the attention of the visitor visiting your website. Before setting this option, implement the customized JSAPI in your website and add the trigger name in the "with trigger name" text box. Set a rule for which the API should be triggered in the Settings -> Automation -> Intelligent Triggers and choose the Invoke JS API option in the Then drop down. Enter the trigger name in the “with trigger name” text box. Hovering the text box will display the skeleton code, using which you can build your JS API code. Implement the JS API in your website. The API will be invoked when the visitor matches the rule. If trigger name is mentioned in the text box then it will be passed as a parameter to the method. The second parameter will contain the available visitor information. 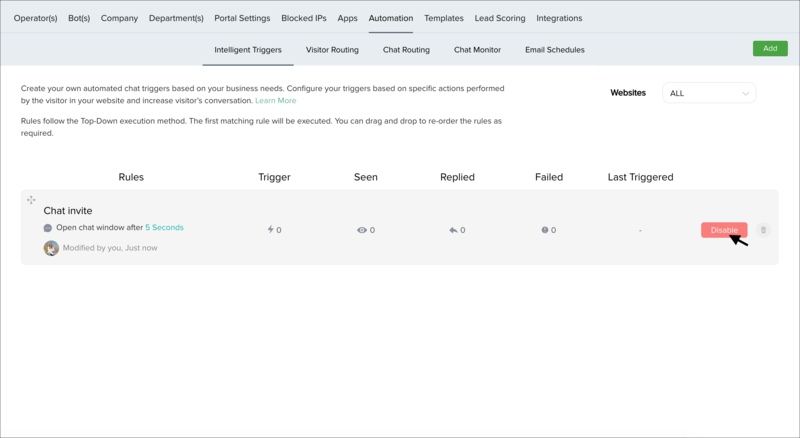 You can open a proactive chat window when the visitor visits your website and help them get in touch with you easily. You can send a chat invite to your website visitors with your name and an invite message. You can set the trigger to show the bubble when the visitor visits your website. You can display the chat button after some time the visitor visiting your website to highlight the chat button. Selecting none will not trigger any action. Now enter the time in the text box after which the action should be triggered to the visitor. You can find an option in the 'when the visitor' field as 'Leaves my website' which will trigger an action when the visitor leaves your website. With this trigger, you can update a field in CRM and add the visitor to a mailing list in Zoho Campaigns with the visitor data based on the activities performed by the visitor in that particular visit. Go to Settings -> Automation -> Intelligent triggers. In "When the visitor" drop-down, select "Leaves my website." Then, choose your criteria and condition in "And if" section. In the "Select an action" drop down, you will find two sections "Update to CRM" and "Add to Mailing list." Choose an action. Now, when the visitor leaves your website and matches the condition and criteria, then the chosen action will be triggered. Update to CRM Lead - This option will help you to push the info to the chosen field in the Leads module. Update to CRM Contact - This option will help you to push the info to the chosen field in the Contacts module. In the "Select an action" drop down, choose an action from the CRM section. Then, the fields available on your CRM for the module will appear. Choose a relevant field and enter a value for the field. Now the info will be captured in CRM when the visitor leaves your website. Then, choose a field in the CRM module. In the value text box enter the name you would like to mention in the CRM field. Now, when the website visitor matches the mentioned condition and criteria, then the value will be registered in the particular field of your CRM module. With the "Add to mailing list" option, you can add the visitors directly to the campaign email list when they leave your website. Choose the add to mailing list option in the select an action drop-down. Choose the "Add to existing list" option to view the list of campaigns available. You can select existing campaign from the "In which existing campaign you would like to add the visitors" drop-down. Choose the "Create new list" option to generate a new list, then enter a name for the new mailing list in the text box. And, if you wish to accumulate and update the visitors at a periodic interval, choose between weekly and monthly. If the condition and criteria of the visitor match then the visitor will be added to the email campaign list when they leave your website. Learn how to convert your website visitors into hot leads with the help of this automation. 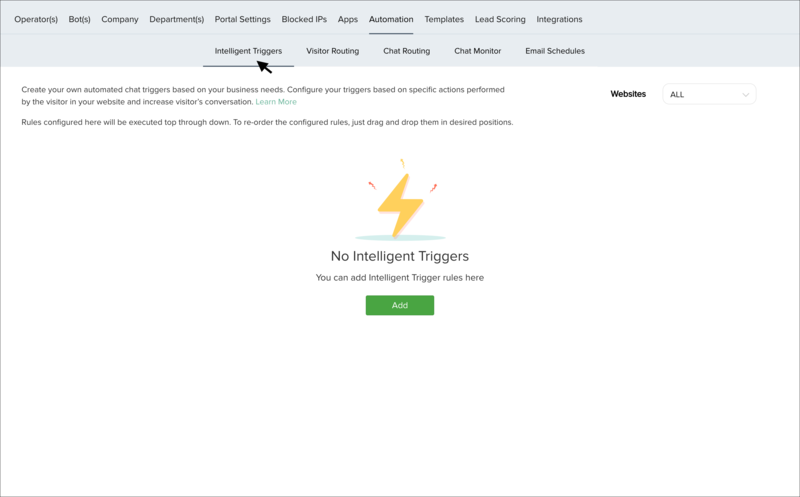 You now have an option in the "Intelligent Triggers" section to trigger your visitors when they perform a custom action on your website. 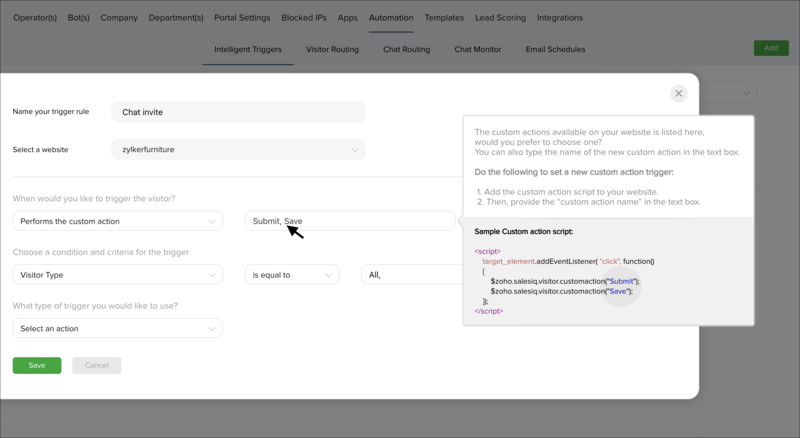 First, you have to add the custom action code to your website, and then you can add the "Custom action" to automate the process of triggering an action when the visitor performs the action on your website. Go to Settings -> Intelligent trigger - >Automation section. In the "When the visitor" drop down, select "Performs a custom action." Now choose a condition and criteria in the "And if" section. Then, select an action you would like to trigger in the "Then" section. Now, when the visitor performs the custom action, the chosen trigger will be initiated. How to delete a trigger? To delete a trigger rule, hover over the particular trigger rule and click on the Delete icon. To disable a trigger rule, hover over the particular trigger rule and click Disable.